NIERSC was officially founded in 1992 in St. Petersburg, Russia after the initiation by Prof. Ola M. Johannessen and Academician Kirill Ya. Kondratyev (1920-2006). The joint-venture had four co-founders: Nansen Environmental and Remote Sensing Center, Bergen, Norway; Research Centre for Ecological Safety of the Russian Academy of Sciences, St. Petersburg, Russia; Max Planck Society, Munich, Germany; and Environmental Research Institute of Michigan, Ann-Arbor, MI, USA with a support of the Joint Research Centre of the European Commission by Prof.Jean-Pierre Contzen (12.02.35 - 27.10.2015). In 2001 NIERSC was re-registred into a non-profit Scientific Foundation. At present it has six founders. 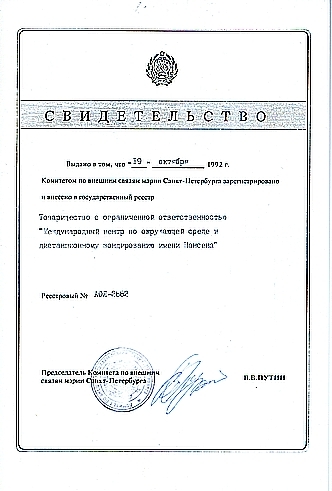 Establishment (registered as a noncommercial company at the office of Vice Governer of St. Petersburg, signed by Vladimir Putin) – 19 October 1992. On 19th October 2012 NIERSC celebrated its 20th anniversary. The staff of our centre looks into the future with optimism and is ready for conducting the research in the framework of new research projects and for supervising new promising PhD students.